At some point, possibly by accident when the glass-plate negative was heated to receive a coat of varnish, a crack appeared in the upper half of the plate. Posted by gerardvanderleun at April 16, 2017 10:55 AM. This is an entry on the sideblog of American Digest: Check it out. I see it made that same crazy turn "in mid-air mind you" that Oswald's bullet did. Looks hauntingly like the crack in my cell. Still works so I don't care. FWIW, it wasn't Booth's little pisswilly lead ball that killed him it was all that probing around trying to find it that did him in. What do you expect, they were gov't doctors? The only problem I have with any of it was that Booth was 4 years too late. Think of all the lives that would have been saved. But then, if Booth had never been born think of all the turmoil that wouldn't be happening today. I listened to the audiobook excerpt. 21st century Americans have very strange sensibilities. Nope, not even close to the path of the bullet that felled Lincoln. See here. 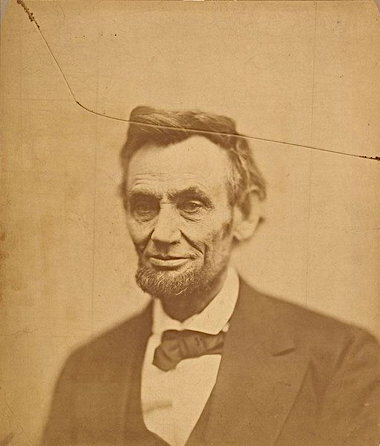 Interestingly, though, this same photo of Lincoln and the supernatural meaning of the cracked plate is featured in the teen-scream movie Final Destination 3 to persuade two of the characters that their own photos of friends foretell which will die next. One of them says it was "the last photograph ever made" of Lincoln. But it's not. "I listened to the audiobook excerpt. 21st century Americans have very strange sensibilities." The 'ghost' is absolutely correct in his opinion of President Lincoln. Best get a few more audio books to listen to on the man. What you may have been told in public school is BS. I fail to understand what Lincoln has to do with spirit rage pooping. I should be more clear. I listened to the audio book excerpt of George Saunders' "Lincoln in the Bardo" included at the Smithsonian link. The author of the Smithsonial essay erroneously states that the real name of Lewis Carrol was Charles Dudwell; it was in fact Charles Lutwidge Dodgson. Just sayin'. Ha ha, made me look. "Ha, ha. Made me look." Bunny through the looking glass, eh?